Two environmental groups filed suit against Stanford on Tuesday, alleging that the University’s operation of the Searsville Dam– and the ensuing water diversion– has harmed local steelhead trout populations. Despite an ongoing investigation of the same issue by the National Oceanic and Atmospheric Administration (NOAA), University administrators dismissed the lawsuit filed by the Ecological Rights Foundation (ERF) and Our Children’s Earth Foundation (OCE). “It’s a baseless lawsuit,” said University spokeswoman Lisa Lapin. Lapin added that the lawsuit would not affect Stanford’s operations at Jasper Ridge or the University in general. Steelhead trout, a variant species of rainbow trout that lives in the ocean but migrates back upstream to reproduce, are listed as an endangered species under the Endangered Species Act (ESA). As such, any activity that “harms, harasses or kills” the steelhead is a criminal violation of federal law, according to Jim Milbury, a representative from National Oceanic and Atmospheric Association’s Fisheries Service. 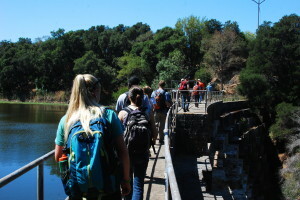 While organizations can obtain permits for routine activities that may incidentally cause minor harm to endangered species, Stanford doesn’t have an Incidental Take Permit for its operation of the Searsville Dam. The University has argued that the dam does not cause enough damage to the steelhead trout to be considered a violation of the ESA. In addition to being a barrier to upstream migration, Sproul said that the dam and Stanford’s water diversion operations harm the steelhead by lowering water volume, decreasing oxygen content and increasing water temperatures. He also argued that the dam is directly killing the steelhead population that lives just downstream. Lapin contested many of Sproul’s claims, arguing that the dam’s negative impact on the steelhead is marginal and is still being investigated. “The only thing I can say with confidence is that anybody who is confident about what to do is not to be believed,” said Philippe Cohen, executive director of the Jasper Ridge Biological Preserve, of the dam’s impact on steelhead trout. Cohen is part of a Steering Committee chartered by Stanford in 2011 to conduct a study of long-term options for the University’s operation of the Searsville Dam and Reservoir. According to an ERF press release, the plaintiffs formally notified Stanford of their intent to file suit on Nov. 20. While neither party could say for sure, both Lapin and Sproul speculated that the notification may have partially motivated the federal investigation, opened in mid-December, into Stanford’s operation of the Searsville Dam. Sproul said that his interest in taking the case and most of his research comes from the documents and reports of Beyond Searsville Dam, a nonprofit environmental organization led by ecologist Matt Stoecker. The organization, which advocates for “a free flowing San Francisquito Creek through the removal of Searsville Dam,” has been a vocal opponent to Searsville Dam since its founding in 2006. According to the court order setting initial case deadlines, the initial case management conference for the suit has been scheduled for April 30.